Just 60km from Hong Kong, Macau is located on the west bank of the Pearl River Delta in southern China. Governed by Portugal until 1999, Macau was the oldest European colony in China. 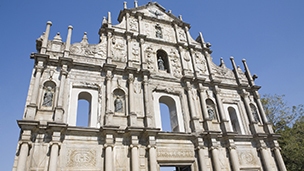 Settled in the early 16th century, Macau’s streets are steeped in its rich history. Its Chinese and Portuguese inspired architecture and landmarks reflect its diverse past and fascinating traditions. From its colourful streetscapes and piazzas such as Barra Square and Lilau Square to monuments including A-Ma Temple, Ruins of St. Paul’s and Guia Fortress, the city of Macau is recognised as the 31st World Heritage site in China. While its rich past and culture make for wonderful sightseeing, Macau is most famous for gambling. The largest gaming destination in the globe outside of Las Vegas, gambling related tourism attracts well over 20 million visitors a year to Macau. The city features an abundance of luxury casinos including the biggest casino in the world. Other tourist highlights not to miss include Macau Museum, Macau Fisherman's Wharf, Camões Garden, Taipa Island, and nightly flea markets.